Rabbi Kenneth Brickman has announced his plans to step down from Jersey City’s Temple Beth-El, after more than 20 years with the congregation, because, he said, the demographics and needs of the community have changed. 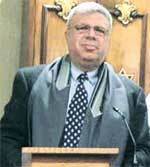 Brickman will retire in June, marking 22 years with the 135-year-old Reform synagogue. With 115 members, Temple Beth-El is the largest synagogue in Jersey City, which once was home to a large, thriving Jewish community that mostly moved to the suburbs following World War II. It is now home to four synagogues and a handful of independent minyans. “The demographics have flipped from when I first arrived, when the congregation was primarily composed of older members,” Brickman told The Jewish Standard last week. Rabbi Kenneth Brickman will retire from the pulpit of Temple Beth-El in Jersey City, where he has served for 22 years. Now the synagogue’s religious school, which started only in the early 1990s, has about 50 children. There were no bar or bat mitzvahs in the congregation when Brickman arrived, and now the rabbi counts at least six coming up. In the next two months, Brickman will officiate at four bat mitzvahs and four weddings. “When I first came, a year would go by without me having (to perform) a wedding in the community,” he said. Brickman pointed to an increasing number of young families and empty-nesters in the congregation, indicative of the changing demographics of Jersey City, which has typically attracted younger professionals before they settle down in the suburbs. Brickman credited an influx of empty-nesters moving out of the suburbs with revitalizing area Jewish life. These people, he said, had been involved with running their suburban synagogues and want to create Jewish connections in their new surroundings. Brickman hopes to remain active with Beth-El as rabbi emeritus, but he would like to see somebody else step up to take on the day-to-day leadership. Brickman came to Beth-El on July 1, 1989. Before that, he spent two years as associate rabbi at Temple Israel of New Rochelle, N.Y., following five years as assistant rabbi in Largemont, N.Y.